Starting with temperature records collected over 100 years ago, Measuring the Earth's Temperature takes the viewer from the earliest weather stations and balloon launches, to a network of super weather stations constructed in the 21st century.Highlights include showing how weather balloon launches work, the anatomy of a weather station, and how weather data, using computers, is transformed into long and short term weather forecasts.This very same data is also used to graph yearly temperature changes across the planet. Measuring the Earth's Temperature simplifies the centuries of complex meteorological data, and answers the question "How do scientists know the temperature of the earth?" 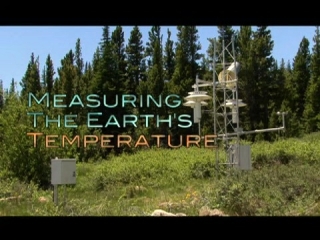 Scientists and meteorologists use meteorology's data gathering, specifically temperature data to measure the Earth's temperature and use it to help them understand the dynamics of climate change and global warming. 00:04:29This chapter examines the many layers of the Earth's atmosphere, including the troposphere, stratosphere, mesosphere, thermosphere, and the tropopaus. 00:04:07The history of meteorology and the collection of meteorological data is discussed in this chapter. 00:05:19This chapter shows how weather forecasters and meteorologists use weather stations as well as weather radar, weather satellites, weather balloons, and the radiosonde to make atmospheric observations and gather data used to create, weather models. 00:03:11The National Oceanic and Atmospheric Administration, NOAA, has built a network of super weather stations known as the U.S. Climate Reference Network, which sends meteorological data that can be used to help understand Earth's climate to the National Climatic Data Center. 00:06:40Temperature data comes from Hadley Center in Great Britain, NOAA and NASA, and is used to track temperature trends and show temperature anomalies - a particular year's temperature difference from the average of many years - that can be used to help understand . Climate Change and Global Warming. 00:02:09Regional temperatures vary but all regions show the effects of global warming and climate change, from the Mid-latitudes loss of glaciers to the Arctic's loss of sea ice and melting permafrost. 00:01:05Scientists use the temperature data in climate models to see what impact global warming and climate change will have on extreme weather, sea level rise, climates and ecosystems.